Philosophical Naturalism… the denial of real things or actual events that are not associated with or caused by natural processes (at least as they are presently understood). In other words, miracles do not happen in fact, merely in perception, and the supernatural does not exist (or at least is not relevant to historical inquiry). Therefore, Jesus did not REALLY do miracles and wasn’t REALLY divine (because those were rejected a priori). Historical Untrustworthiness of the Biblical Record. Basically, if the Bible said something happened… maybe it did or maybe it didn’t (Like the song “It Ain’t Necessarily So” in Porgy and Bess). Or maybe it happened but it got misinterpreted and mixed up. Additionally, some criteria used by many to determine historicity seems pretty inane, to me at least. For example, the (Double) Dissimilarity Criterion that says that historically accurate facts about Jesus are dissimilar to Ancient Judaism and the Early Church. Despite the pivotal character of Jesus in history, denying his continuity with 1st century Judaism and 1st century Christianity seems to have no justification (again in my opinion). So I could simply reject the movement as a whole and ignore it. But, in fact, I find it rather interesting. And not all of those seeking to understand Jesus within a historical context start out with presuppositions that I would reject. So I have been reading “The Historical Jesus: Five Views” edited by James K. Beilby and Paul Rhodes Eddy. SO WHY AM I TALKING ABOUT THIS AREA OF STUDY WITHIN THE CONTEXT OF MISSIONS? The book (pages 34 and 35) references a book by Leander Keck (1971) titled “A Future for a Historical Jesus.” In it, he discusses why learning of Jesus (the real Jesus who lived and died in 1st century Palestine) is important to Christians. He listed four main reasons. I will reorder them from the least important missionally, to the most important. A. Prevents the theological extremes of a type of Docetism at one end to a “self-validating fideism” at the other. I won’t deal with this one… it is more for theologians although we certainly can see the risks of a gnostic (or at least gnostic-ish) mindset at one side and a religious irrationalism at the other. B. It gives credence to Christian preaching. We are told to have Jesus as our example. If we tell people that they should behave a certain way since that is in line with Jesus (in action, intent, and character) but that is not accurate, then our calls to persuade are likened to telling children to behave a certain way to make sure that they are on Santa Claus’s “NICE” list. Understanding Jesus in His full character, gives us better guidance on how we are supposed to live. Consider the picture at the top of the post… does your understanding of Jesus agree with the message… Does Jesus love Osama? Does YOUR Jesus love Osama? I have met people who are convinced that Dan Brown‘s description of Jesus and early Christianity is correct because (amazement time… ) Dan Brown said he researched it, and it is correct (“Hey, its right there in black and white at the beginning of “The Davinci Code” so it must be true.”) Here in the Philippines, any sort of oddball belief (often originating from the US or Korea) eventually seeps into the country. Ignoring them, or blanket discounting them without thought doesn’t help. Evangelicals like the statement “God said it, I believe it, that settles it.” But even if that settles things for us, in missions we must share and disciple those who are bombarded with all sorts of curious innovations. I have seen documentaries on TV where the Gospel accounts (Matthew, Mark, Luke, and John) are placed side by side with the “gospels” of Judas, Philip, and more and more. It is unconscionable that accounts with a provenance back to the earliest decades of Christianity are treated as no more reliable than accounts written centuries later and discounted by the church. We need to know what we believe and why. D. We now live in a “pluralistic marketplace of ideas.” We either recognize this fact, embrace this fact, and address this fact, or we risk becoming culturally and intellectually marginalized. Many religions and sects reference Jesus in their understanding of faith. The Babylonian Talmud references Jesus, as does the Quran, the Book of Mormon, the Kitab-i-Aqdas, and Guru Granth Sahib. What is our basis for evaluating these as reliable or distorted pictures of Jesus. We no longer live a cultures where we are arguing about different flavors of Christian understanding. Every belief is everywhere (especially with the Internet). We can’t simply start with “What does the Bible say” since our neighbors may not know or even care what the Bible says. Yet people world-wide are interested in Jesus/Isa/Yeshua. Are we competent to tell people who Jesus is? Ultimately, in missions we don’t have the luxury of dealing only with mature believers. We must deal with unbelievers, seekers, and immature believers. As such, we need to understand who Jesus was and is, why we believe that, and what our underlying principles in understanding Jesus’ character and behavior. Is our faith (a la Mark Twain) believing what we “know ain’t so”? Or is it something more. As missionaries it MUST be something more. I will be teaching Missions History at seminary (PBTS) and Cultural Anthropology at ABGTS this upcoming term. I like both subjects… but I have a special love for Missions History. I taught the class once before and it was one of my two least successful teaching efforts (the other being “Perspectives on the World Christian Movement”). I look forward to correcting my mistakes this time. Raised Baptist (and still one) I was disconnected from History. We never really studied where Baptists come from. (Found out later that some people felt like Baptists were founded by John the Baptist… or have always been around in some distinctive and secret form… the Trail of Blood). To a large extent to the best of my memory, Christian history stopped around the time of St. John on Patmos… or maybe the martyrdom of Polycarp, and resumed with John Bunyan, William Carey, Roger Williams, and Charles Spurgeon (with a passing nod to Martin Luther, John Calvin, and— perhaps— Augustine of Hippo and Francis of Assisi). My Christian upbringing was largely ahistorical. Hymns were the one bit of a link with Christians in generations before us… going back centuries to Isaac Watts… and a few with Latin roots. (It is arguably a bit sad in a way that even this tenuous link to the past is being severed with the rejection of traditional or even blended worship music). Other than that, we practiced “open worship” and a minimum of symbols. We do baptism and Lord’s Supper (Eucharist) because the NT church did, but ignored other rites (because the early church did not). Of course, Baptists are not alone. There are a lot of “restorationalists” out there– some going back to Azusa, others going back to Campbell— some referring to an important event, others to an important person. History before those people or events is deemphasized, either by ignoring, or by revising the history to fit into a certain perspective. Is there something lost in this? I think so. Admittedly, I am not a liturgical person… I don’t need a whole lot of symbols… I don’t need to sing songs in Latin, Greek, or Coptic. But I still believe there is something lost when we are disconnected from our history, and even though I am emphasizing Missions History, it is hard (and rather pointless) to make a strong separation between “Christian” and “Missions” History. So why is it beneficial for Evangelicals to know church history? The wisest man learns… but is not quick to draw conclusions. In missions we discover that paying people to be Christians doesn’t work very well (and in the Philippines we seem to have to learn it over and over and over again). We see the opportunities of tentmaking and its problems. We see power encounter used and abused, we see the effectiveness at times and the moral bankruptcy of gunboat evangelism. We learn the benefits and the costs of linking faith and government… ecclesiastical and political power. We see movements and methods rise and fall (and sometimes crash). History gives us great opportunities to learn with the tantalizing hope of not repeating those same mistakes. 2. We learn that we are not so unique. The Christian world was full of saints and sinners, the caring, the careless, the cults, the cranks, and the corrupters. The truth from Ecclesiastes holds (at least in a general sense) “There is nothing new under the sun.” The problems of today were, in many ways, the problems of the past; indeed, the problems of the human condition. The problems of greed and power, hope and faith, love and lust, have been with us and will continue to challenge us for the foreseeable future. The views of social ascendancy (such as in post-millenialism) or of the downward spiral (in pre-trib/pre-mil) are challenged by the meandering path of history. History defies the simple lessons and the consistent structure. 3. We learn that we are part of a family. Evangelicals often seem to have an unwritten (yet powerfully felt) belief that one is “Saved by faith alone… and by not being Catholic.” In some other parts of the world, “Catholic” may be switched with “Orthodox” or something else. I have met people who are categorized in the Evangelical family who believe that one cannot be Baptist (at least not doctrinally Baptist) and be saved. But in the history of Christianity and Missions we discover that we have relatives that fought over issues of Gnosticism and Arianism… not as some sort of Ecclesiastical crushing of free thought… but in a quest to relate contextualized faith and practice with revelation. We see them struggle with the concept of canon (the standard) for truth. Our spiritual ancestors struggled to share their faith in hostile places often giving their lives. Some dealt with people of other faiths with the sword, others with the Bible, others by separation/ghettoization, and others with divine love. Sometimes they were wildly successful. Sometimes they were crushed. Sometimes they struggled and persevered. Sometimes they did evil and called it good. Sometimes did good that was called evil. As a human, I have American, English and Swedish roots. As a Baptist, I have Dissenter, Anglican, Calvinist, Lutheran, Celtic, and Catholic roots. They are my spiritual heritage. They are my family. Like all families, some relatives disappoint, some relatives inspire, but I believe we would be wise to see our spiritual journey in historical perspective. 4. We understand truth in and through history. Don’t get me wrong. I don’t hold history/tradition on an even playing field with Biblical revelation (just like like I don’t hold modern day attempts at “new revelations” on the same level as the Bible). Yet, much of the errors we have to day spring from grabbing a stray phrase from the Bible, a peculiar innovation from a specific point in time, an extreme interpretation of a nuanced passage of Scripture, and running with it. When we disconnect the Bible from history (the Bible itself frustrates such an attempt, being a work of history… not only involving historical narrative, but historical in its very production) we can apply almost any interpretation we want. It is through the early church fathers we gain perspective of the faith as it was handed down to them from the Twelve. (Yes, I personally do believe some things they got wrong or uncritically contextualized… but that is human… and their humanity is comforting in many ways.) Additionally, truth as gained from practice and reflection may still be truth. So it is wise to discover the truths that were gleaned (often with blood) over the centuries. A lot of the innovations of the last few decades (Prosperity Gospel anyone?) have developed from a careless Scriptural hermeneutic tied to an ahistorical perspective. Many cults develop by taking a few verses in the Bible (or another revelation “adding” to the Bible), defining these as the truth from which to filter other verses and create a mythology of their own origin that goes back to the NT church (and squelched by evil majority). Sadly, Evangelical groups (Baptist, Pentecostal, Charismatic among others) have done this along with various Restorational groups and heterodox groups (JW, Mormon, etc.). Even the old “apostolic” faiths like to link to the earliest church. But the earliest church was unlike all other groups… and for a good reason. They lived in a different time. Our job is NOT to restore the first century church, but build the 21st century church. Evangelicals often are Hydroponic Christians. We have roots and these roots do bring us the nutrients of God’s word. But roots are for more than nutrients, they are also for stability. As firm soil provides a foundation from which the roots can give stability to the plant, knowing our history can provide us with the stability that we lack. I was talking to my son about a logical glitch I have in a couple of my blog posts from a few months ago. He suggested that, instead of fixing them, I put a blog post about them. In a second post, I was complaining about a self-styled “prophet” from America (they all get over here to the Philippines eventually) who stated that a leader of a large religious movement here would be President of the Philippines… if the people would be faithful to God. Now, personally, having no interest in that individual ever running any particular organization… least of all government presidency, the prophetic exhortation encouraged me to want to be “unfaithful.” Still, I was annoyed by the message since it wasn’t testable… the “prophet” (“prophetess”) gave herself an out. If the person becomes president (hasn’t so far) she must be a true prophet of God. He the person does not become president… she wasn’t wrong, the people just weren’t faithful enough. You will note, I placed these “prophets” in a no-win position. If there is no message of exhortation, I question that it could be a true message from God. If there is one, I question the individual’s unwillingness to truly be tested to see if what they have to say is from God. That’s not really fair. I have to admit it. Part of the trouble I have is with term “prophecy” itself. I would rather not see it used. Most times “prophecy” is used in the Bible, the term “exhortation” would appear to be more appropriate. Prophecies are usually not the fortuneteller type… but the word of exhortation or encouragement to be faithful and true to God. When the self-styled “prophets” (sorry… I just have to use quotation marks… can’t help it) go into fortuneteller mode… perhaps it would be better to utilize a different term. Maybe we could call it “apocalypsis.” The term is from the Latin for the revealing of what was covered or hidden. The reason for the different term would be to release us from the messy baggage of the world prophecy or prophet. A prophet in the New Testament (and in the first century church) seemed to primarily be one who goes from church to church and preaches, encourages, and exhorts the membership to be faithful and holy. It is curious that in the Didache (apparently a first century work) prophecy was not to be questioned… but the prophet was to be tested. That seems to make no sense. Perhaps others would understand this better. To me it suggests the ambiguity of the role. Prophets were to be from God and to be received as if they were speaking God’s truth to us. Yet their message was not supposed to be innovative… but point people back to the words and life of Christ. The Disciples are to point people back to Jesus, His words, His example. The Spirit of God also points back to Jesus. In doesn’t seem to be a primary role of God’s disciples or the Spirit of God to be innovative but restoring people to the key truth in Christ. Being a theist doesn’t mean one is better than an atheist. Atheists claim that theists can be really really evil since they can use their “god” as justification for nearly any heinous act. Jesus appears to agree with the charge of atheists here. A healthy theism only exists with a true understanding of who God the Father is, and who Christ is. So, there is my confession. I rejected prophecies because they have caveats and because they do not have caveats. Annoyingly, both arguments seem to be sound. Perhaps it is best not to think of them as prophecies at all (apocalypsis or otherwise) … but the opinions of people who want to be listened to. Instead of using titles to try to get adherents, I believe we should focus more on pointing people to Christ… as witnessed and testified to by the Twelve, and confirmed in the Spirit of Truth. 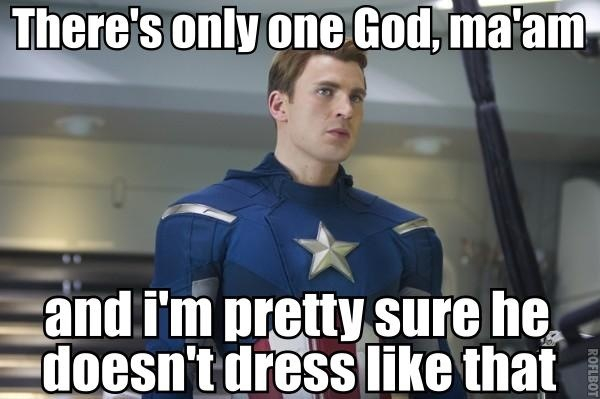 After The Avengers came out, many people discussed Captain America’s famous line about God and Thor. Some people were surprised that Joss Whedon, an atheist, included the line in the movie. Others were either pleasently surprised or dismayed at the inclusion of religion in the Marvel Movie Universe, but the most interesting response, and the one I’m going to address here, is: How can Captain America still be a monotheist when he knows two gods personally? People also pointed out that characters like Iron Man, who is typically written as atheist, would also have issues coming to terms meeting two gods. I realize that Part II, I sort of “shot my wad” in that I essentially said that doing missions in today’s culture is like doing missions in the Marvel Universe, since the today’s culture is like the Marvel Universe culture. The loop is kind of closed leaving little room for more than expounding further on the basic idea. So that is what I will do. 2. The Social Primacy of the Individual. You might be wondering about why I have an image here of the Justice League (from the DC Universe) when I am talking about the Marvel Universe. But take a look at the image and compare it to the Marvel image on my last post (Part II). You may notice a decided difference. The Justice League is clearly a team, a strong coherent social unit. If you websearch other images of the team, most show a similar quality. In this one, the members have a common focus and appear to have a common determination and will. They are acting as one social unity. In some other images, they stand in a half-circle looking in different directions. But even here, the idea is still of one team. Even though they don’t have a common focus, they clearly have a common purpose, to stand guard in vigilance. On the other hand, the Marvel Universe image does not show a team… it shows a group of individuals who are, for some reason, required to share the same floor space. Truthfully, it is probably an error of many to compare the Justice League with the Avengers (or maybe the Teen Titans with the West Coast Avengers). The Avengers feel more like the Dirty Dozen in many ways… a conglomeration of heroes brought together by common necessity more than common vision. This the world we live in today. Few places outside of North Korea (and pockets of zealots of different types) do we find groups of any sort having a higher position than the individual. Many of us (especially in the West, although this is a stereotype) have almost lost the capacity to put into words or thoughts the idea that the will of the family, corporation, church, or any other could take priority of personal freedom, personal fulfillment, or personal pleasure. I recall an episode of House (I haven’t seen very many). In it, one of the doctor’s was having a difficult time with the worldview of one of his patients. The patient was a member of a Gypsy clan. The patient was brilliant and had an interest in Math and Science, but would not go to higher education because that was not the wishes of the clan. The doctor could not understand why he wouldn’t “live his own dream.” The patient, on the other hand felt sorry for the doctor because he was disconnected from family… giving up so much belongingness for a personal (selfish?) achievements. So here we are. Do we embrace individualism? I would say NO. On the other hand, do we react against it, creating little Christian societal cults without individuality? NO also. We can’t challenge a culture by simply completely rejecting it. The Bible, in fact, seems to support neither. The Bible says to submit to authority in government and in church. But it also says to reject and condemn ungodly leadership. We are to honor our fathers and mothers but we are to “hate them” choosing God first. We are to be united in Christ, but we are redeemed as individuals. One might argue that the highest social unit on earth is the two member social grouping made up of an individual and God. From that grouping flows secondary responsibilities to self, family, church, government, and society. We live in a world of individuality, so we need to both embrace and challenge it. 3. The Ambiguous Nature of Hero and Villain. It is tough to be a hero in the Marvel Universe. Spiderman is often misunderstood and mistreated. The X-men suffer from bigotry and attempts to register and control them. Being a hero may not make you loved. It may not even make you liked. You might be reviled, judged a vigilante. Like in The Incredibles, doing good often brings about bad results/destruction. Does a hero have the right to act unilaterally… serving as judge, jury, and executioner? Heroes are often plagued with uncertainty. Why are they doing this… dressing up and placing their lives at risk for some “noble” cause. Do they live based on a high moral self-accountability, or a personality disorder? Should they use their powers sacrificially? Or is it okay to reap personal benefits? Heroes are not absolutely sure what is moral/ethical. Does the end justify the means? Does the motive support or negate the goodness of an act? Is it right to act when one does not know for sure the results of one’s actions? In fact, in almost any act, there will be winners and losers… those who benefit who shouldn’t and those who suffer who shouldn’t. Is it better to do nothing? Must one only act in response to evil action, or can one act preemptively knowing that evil is being planned? What about the anti-hero? This is the person who seeks to fight evil… but does it through wrong means or for wrong motivations? Should they be considered a hero or not? Punisher fights crime as an act of vengeance… he kills rather than seeks to have the justice system take over. Is that acceptable or not? Spawn (from a different comic) utilizes demonic power to fight evil. Does the noble purpose make the utilization of such evil power acceptable? And what about the villain? Some villains just seem to be evil (self-serving, sociopathic). But some have a strong humanity to them. In some cases it seems appropriate for the heroes and villains to join forces when their is a common (and greater) enemy. Is that acceptable? Some villains actually fight evil… and do this by placing safety above personal freedom. These controlling villains… are they really doing evil… or violating a cultural norm? Missions is like this… there is a lot of ambiguity in our actions, purposes, and motivations. If it “advances the kingdom” are all actions justified? Or do we have a higher set of standards (in action, intent, motivation, short-term goal, and long-term goal) that must be considered to see if we are on the side of the hero or the villain? Decided to stop here. Found a great Blog on God and comics. Will reblog it. I. First, the Marvel Universe fits the Worldview (or Zeitgeist if you prefer) of those around us. Marvel Universe. 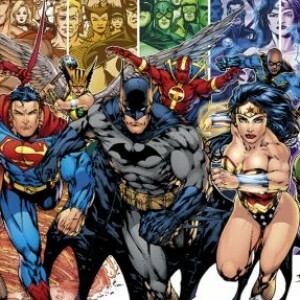 The DC Universe, particularly its classic version as seen in the Justice League, follows the mindset of pre-World War II. Part of this comes from the fact that DC (Detective Comics) has its roots from between World War I and II, and is modeled best with Superman. Marvel, although having roots in between-the-wars Timely Comics, was transformed by Stan Lee et al in the 1960s and was well-grounded in the culture of that time. Spiderman is, perhaps, the best example of this time. While Superman was an alien of almost unlimited power and moral integrity, Spiderman was very a very human youth dealing inexpertly with limited powers and challenging ethical settings. In 2003, well after I stopped collecting comics, DC and Marvel joined forces with a cross-over between Justice League and the Avengers. They had a four issue team-up. The two worlds meet up. In it, we see the differences more starkly. The Justice League seeks to make their world better, while the Avengers seek to keep their world from falling apart (as Zimmerman noted). THIS IS A KEY POINT… because it says much about how each view power. With the Justice League… power is used to control and achieve the vision of those with the power. With the Avengers, power exists in the chaos and frailties of humans. This control is to be kept in the hands of “normal humans” with intervention only occurring (from the superheroes) when power is used by evildoers to attack this freedom. This is most clearly seen in the X-men where the X-men seek to dialogue and persuade human leadership through words rather than through force or sedition. Magneto and friends wish to utilize their power with control and are seen in the Marvel Universe as Evil. The Western Powers were killing each other (even more ruthlessly than in WW I). The first two Fascist Powers were Italy (home of Roman Catholicism) and Germany (the Birthplace of Protestantism). It was hard to say for sure that Christians (or anyone else) was reliably right or reliably wrong. Was “Christendom” making the world better. Were our leaders really wise? The atomic (or better said, nuclear) bomb was the product of “wise leaders” and “intelligent scientists.” Technology doesn’t necessarily save lives… it can also destroy the world. We may not live in a hostile world with benevolent science making things safe for us. We MAY live in a benevolent world with hostile science (controlled by people ill-prepared to use it wisely) seeking to destroy us. Improved communication, media, and travel allowed for bridging of national and cultural boundaries like never before. Bigoted opinions about “them” were challenged because they could be seen and heard and visited easily. Leaders could now be accessed and viewed up close, showing their considerable failings. Today we live in a world that questions authority… frankly, because we know that human authorities are untrustworthy and unreliable, The move in many churches to teach unquestioning submission to authority is probably a bad idea and culturally anachronistic. It is counter-cultural… not that that is bad necessarily. However, it is unworthy since only divine authority is worthy of unquestioning submission. Additionally, in the Bible, human authority is both submitted to and challenged. Power and authority are best when they are not in the hands of the same people. The Justice League felt that the Avengers really had not been doing their job seeing the poor job they have done in making things good in their world. The Avengers were disturbed by the Justice League’s cavalier use of power to control, and their willingness to embrace the adoration (idolatry) of those they oversaw. “In the eyes of the Justice League, the Avengers have let their world go to seek, they may be powerful, but they are not heroes. The best world is one where everyone is safe and secure, prosperous and at peace. The world of the Avengers cannot boast of such accomplishments, therefore the Avengers have failed in their mission. The government in the DC Universe loves the Justice League (and vice versa). In the Marvel Universe, the government uses superheroes but the relationship is much more tense. Superheroes in the Marvel Universe are as likely to be ridiculed as lauded… as likely to be misunderstood as supported. Spiderman was a folkhero at times and viewed as a vigilante or a criminal at other times. We live in a time of FUD (fear, uncertainty, doubt). We are pretty sure our leaders don’t fully know what they are doing, and that what they are doing is often done in part with selfish motives. Power is morally ambiguous and in the hands of the few is likely to cause more bad than good for the many. Science, technology, intelligence, and “special powers” are unlikely to make the world a better place… but in the hands of imperfect people trying their best (in their own limited ways) to do what is right, perhaps the world won’t fall apart. In the Marvel Universe we know that heaven will not be created on earth through human (or even superhuman) powers. In Christianity we know this… or are supposed to know this. Only God can bring heaven to earth. We can’t save the sinking ship… we can do little more than man the lifeboats and rescue the drowning. This is the Marvel Universe and the world we live in. We live in (right or wrong) an individualized world. If missionaries were superheroes (and we are not) we would be like the Avengers… full of problems, uncertainties, and on living on the edge of error and misstep. But, with good teamwork, humility, and guidance from “the truth” we have hopes to do some good in this world. We are likely to be admired occasionally, and thought of as odd misfits or troublemakers the rest of the time. I used to be a comic book collector. I still have hundreds of comics stuffed away back in the US. I tended to collect mostly Marvel Comics, although far from exclusively. Part of this was that I found it easier to relate to many of the characters, such as Peter Parker, or many of the X-men with their uncertainties and angst. Superman was too “Nietzchean” and wasn’t even human anyway. Marvel Comics (unlike Archie or the more overtly Christian comics) does not have a lot of Christianity (as a well-defined Christian faith). Nightcrawler (Kurt Wagner) is the only character that I can recall who was a Christian. Cleverly, he had the appearance of a demon, and was the offspring of a demon and a mutant villainess. In Nightcrawler we see the ambiguity in Marvel of one who appears evil and yet was good (even sacrificing himself for his team). Of course, the ambiguity doesn’t end there. There are antiheroes, people who do good with evil means or evil motives (very teleological). We have heroes who are uncertain what is the right thing to do. We have villains who have redeemable qualities, even moments of heroism. We have people who defy destiny (like Nightcrawler… or to draw from a different Universe, Hellboy). To me, the world we live in is in many ways like the Marvel Universe (although people in the know might see the world as more like the NEC Universe). So in the next few posts I would like to look at some of the correlations between our world and the Marvel Universe, and correlations between our mission and the mission of many of the heroes in comicdom.